Each year, millions of pets go missing and many don’t make it back home. Microchipping your pet is a safe, simple and effective way to prevent this tragedy. About the size of a grain of rice, identification microchips are encoded with your pet’s vital information and implanted beneath the skin, usually between the shoulder blades. 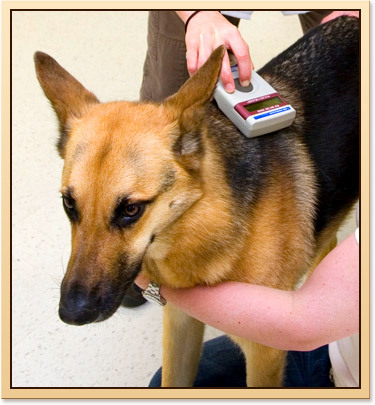 River Trail Animal Hospital uses the HomeAgain microchip system. HomeAgain provides a number of services useful to pet owners, such as their National Pet Recovery Database, Lost Pet Specialists, Rapid Lost Pet Alerts, Lost Pet Medical Insurance, Travel Assistance for Found Pets, and more. Ensuring our clients have convenient and timely access to competitively priced medications for their pets is an important aspect of our veterinary practice. More than ever before, medications play an important role in helping cure a sick animal, relieve pain after an injury or surgery and manage chronic conditions such as arthritis and diabetes. Without these medications we would see higher mortality/morbidity rates, shorter life spans, and degraded quality of life in our companion animals. The team at River Trail Animal Hospital maintains a comprehensive pharmacy and can quickly access any medication necessary for the care of your pet. Additionally, because we are the prescribing veterinarian, we can ensure a direct link between the exam room and our pharmacy. This means your pet will receive the right medication, at the right dose, in the right form as quickly as possible. We will also be able to easily guide you on the medication's use and monitor its effectiveness.